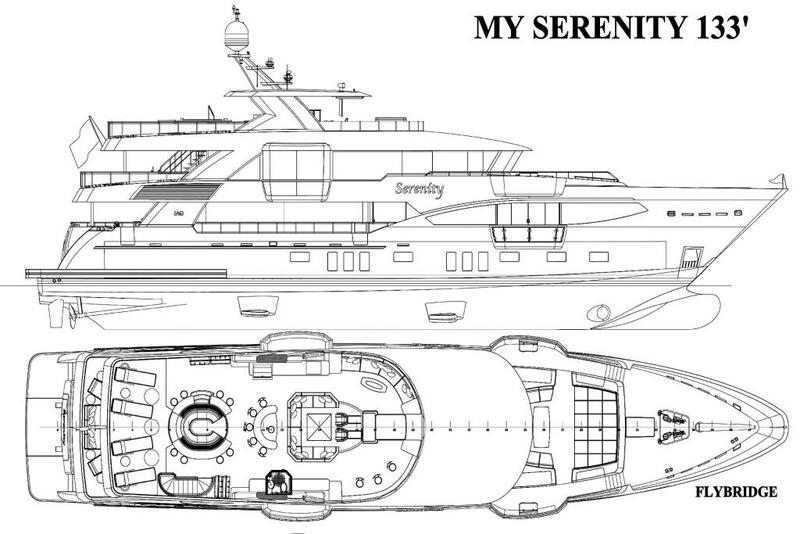 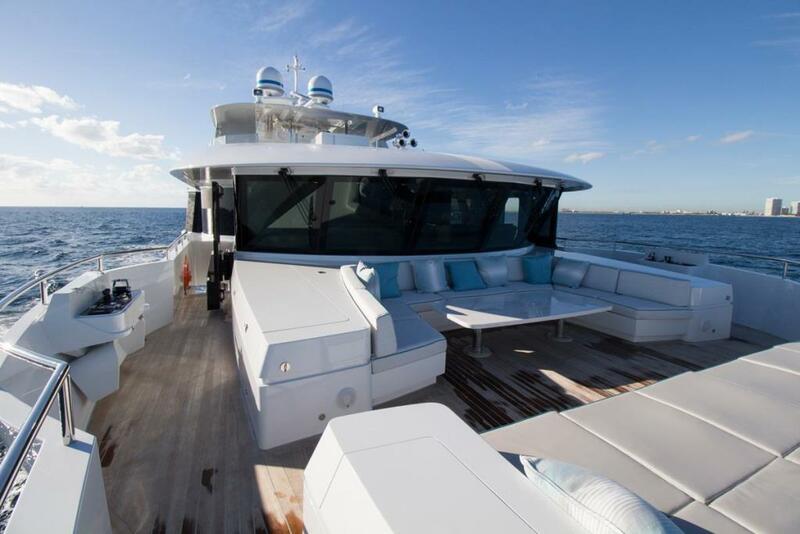 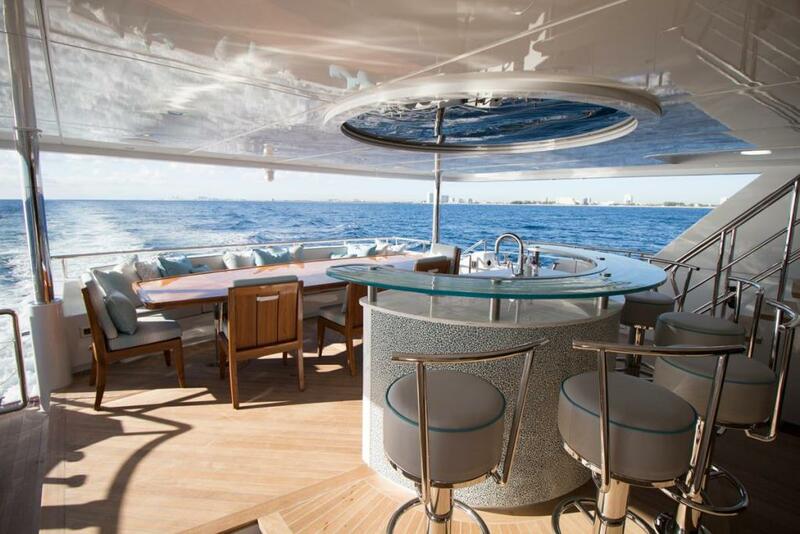 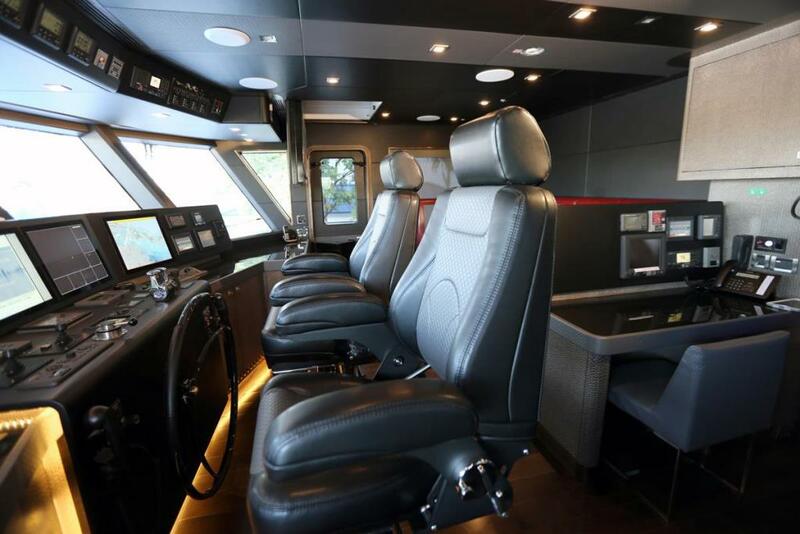 Serenity was created by Evan K. Marshall Design (EKM) for charter or private use. 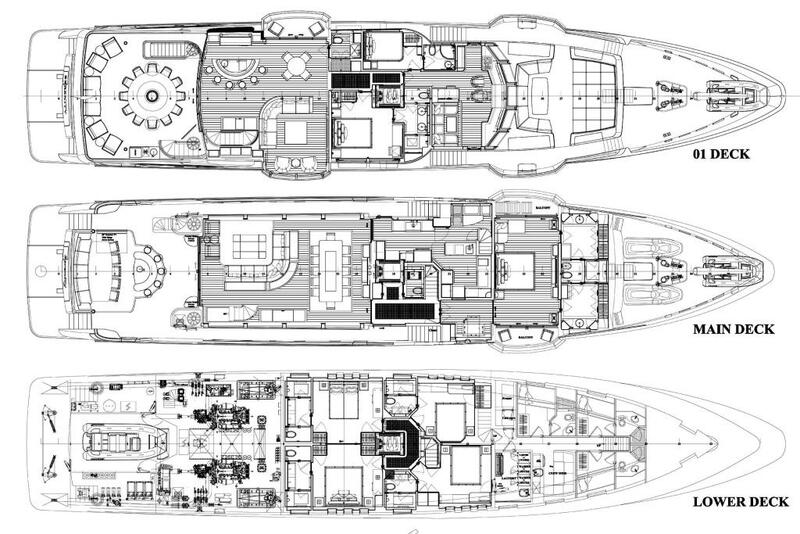 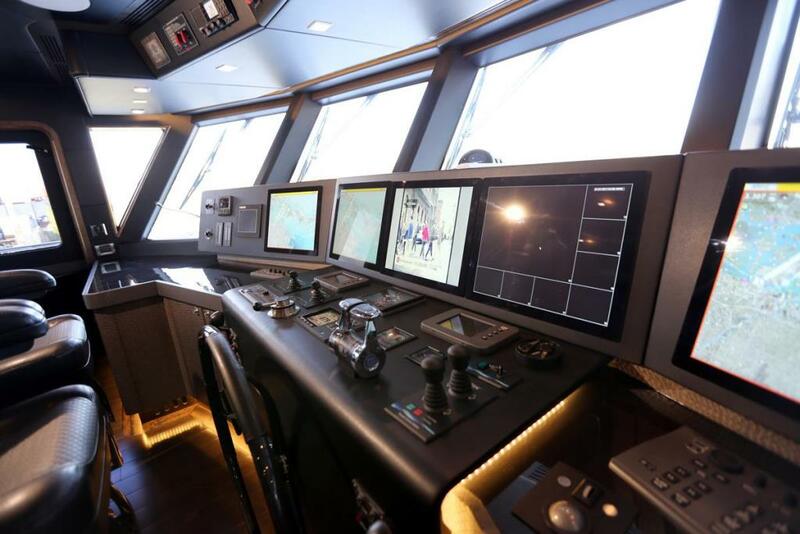 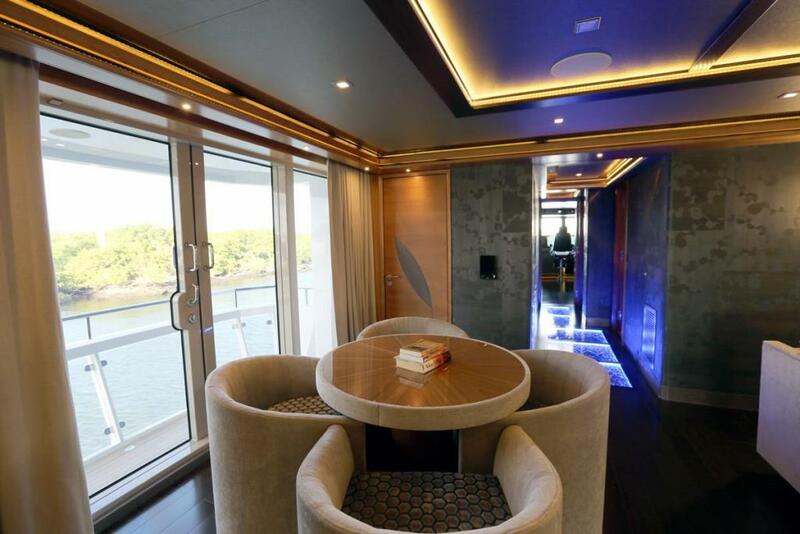 She is a spectacular Tri-Deck Motor Yacht, the latest in EKM design. 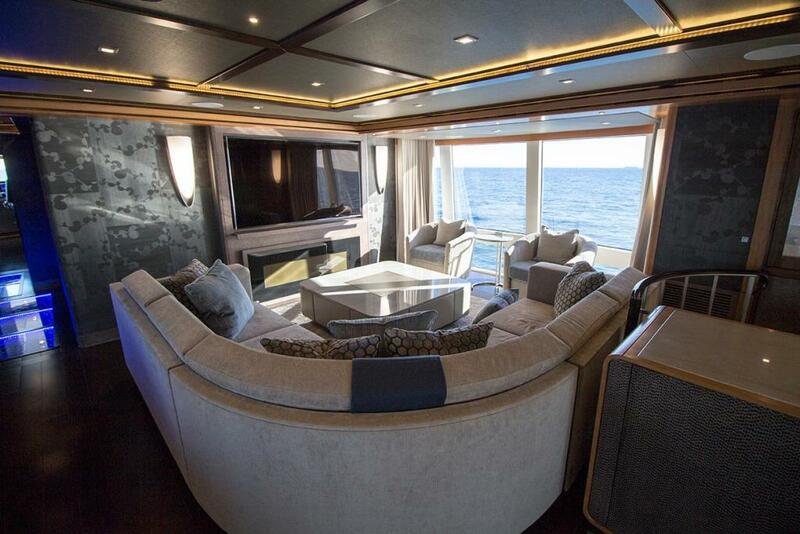 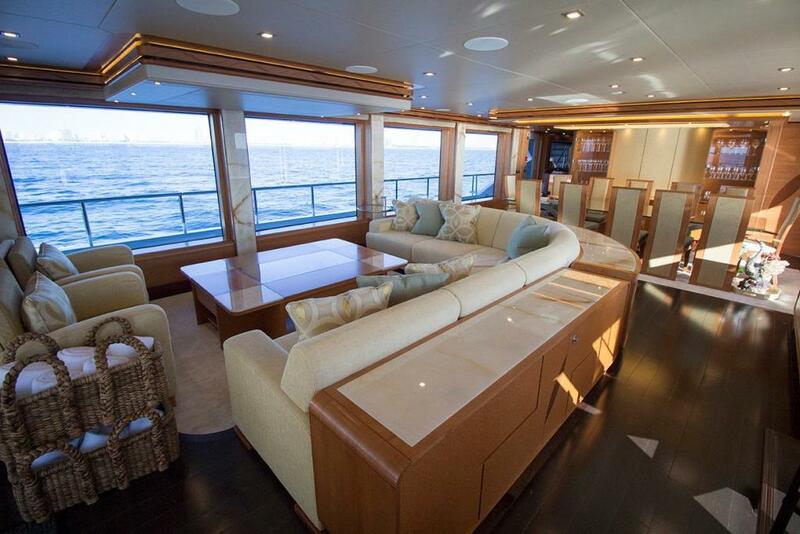 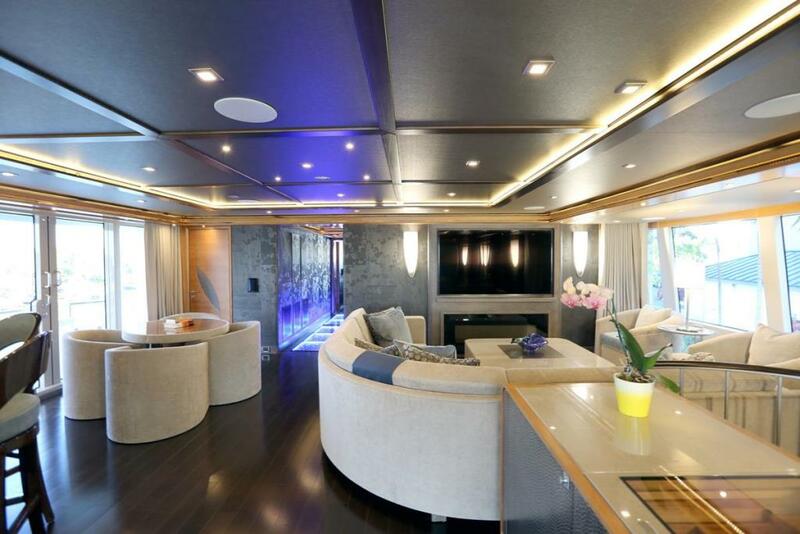 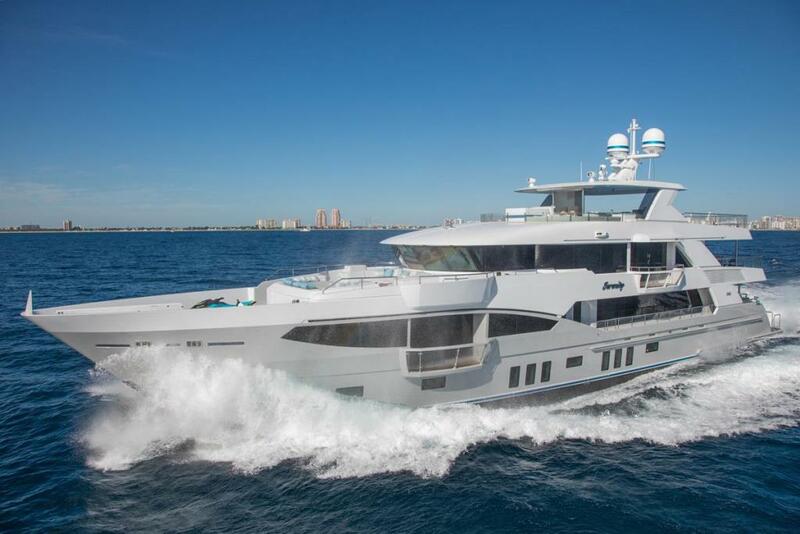 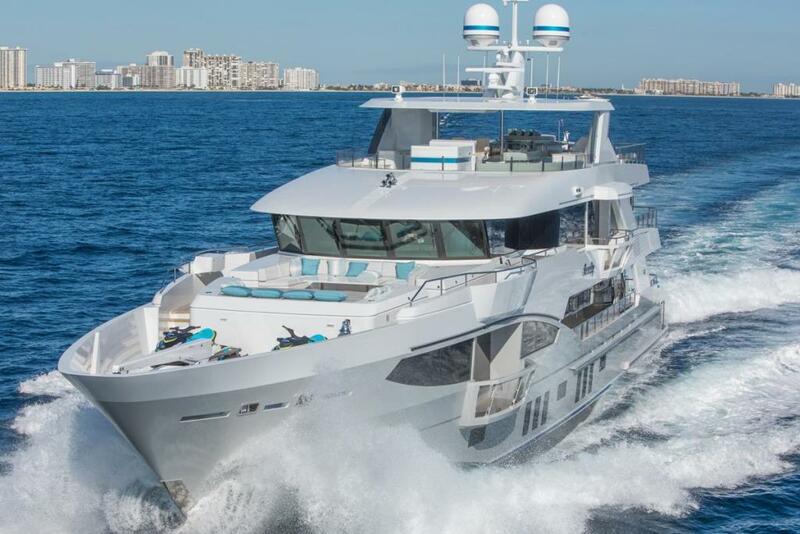 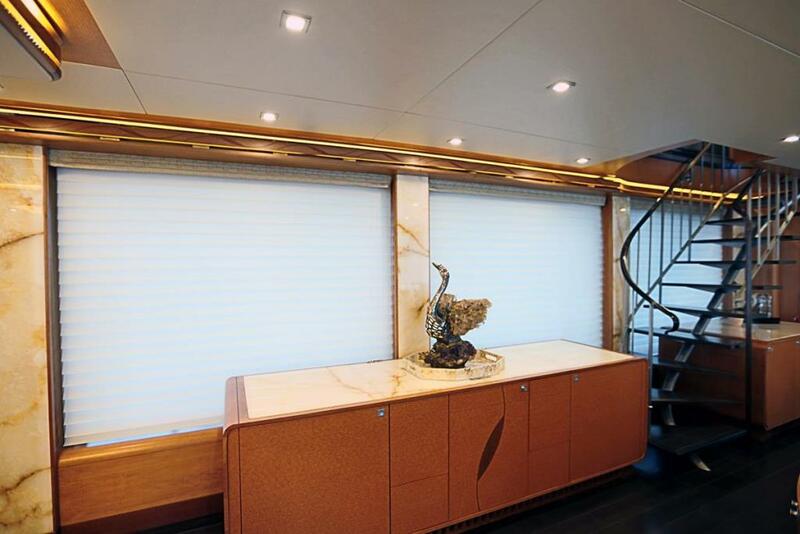 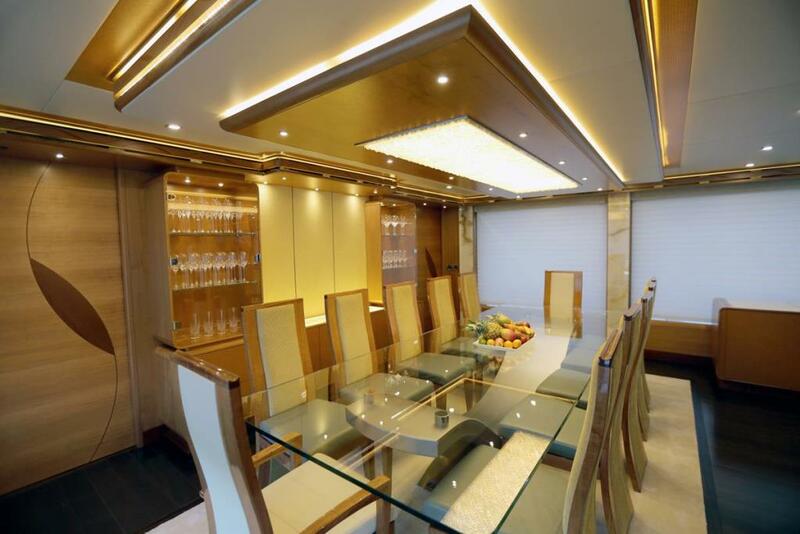 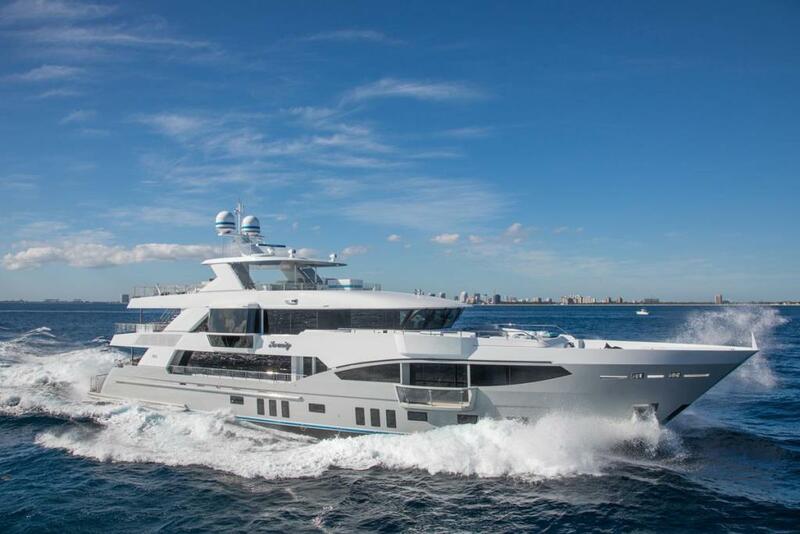 Her fit and finish are sure to impress the most discriminating yacht connoisseur. 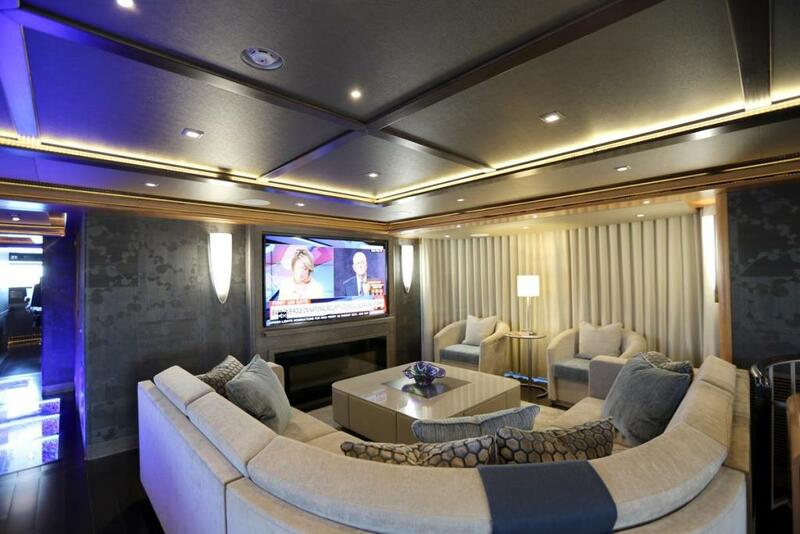 Major highlights include an interior 4-Level elevator, floor to ceiling windows, multiple balconies (Salon, Master, and Skylounge), light box flooring, backlit onyx, and multiple entertaining spaces and private areas for 12 guests. 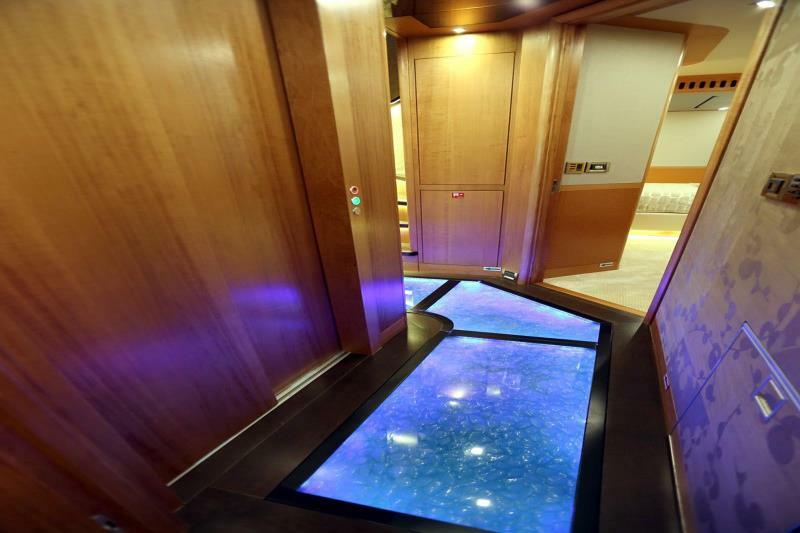 A spectacular waterfall jacuzzi on the Flybridge and wading pool with backlit skylights showing through the ceiling of the main deck are designs unique to Serenity. 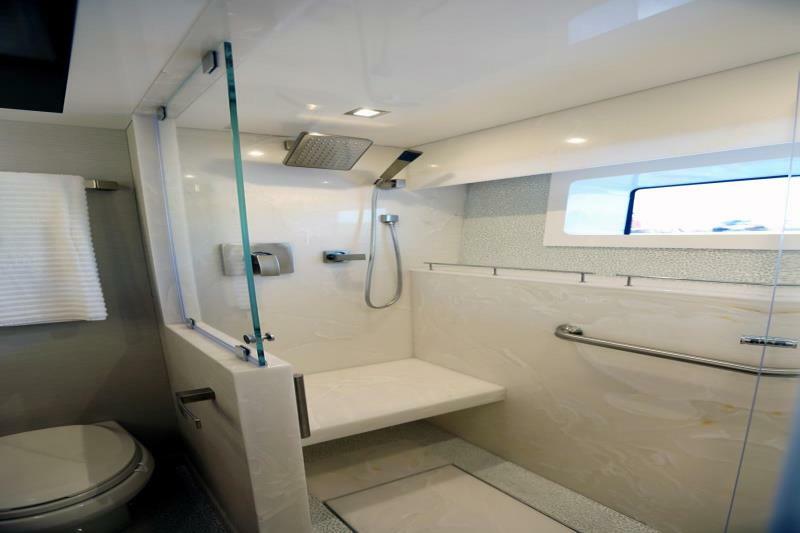 Garage/Beach with exclusive Z-Lift System that creates a perfect underwater beach allowing easier egress from the water for divers or swimmers. 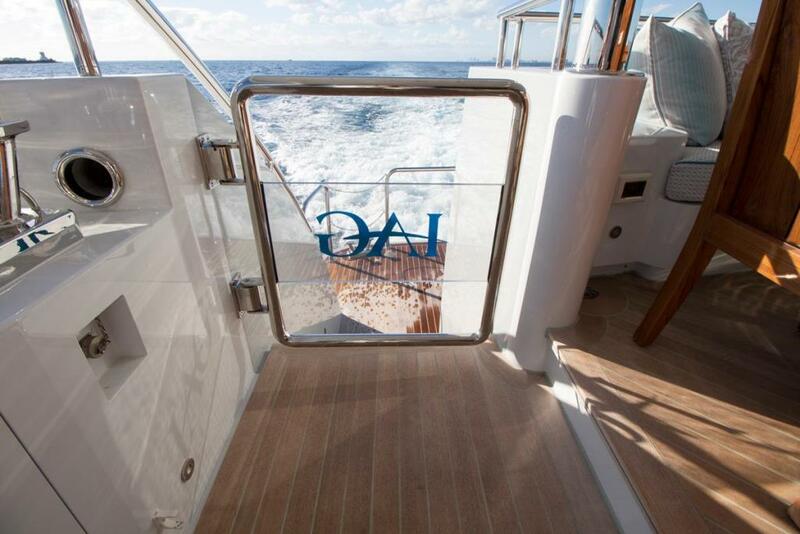 It may double as a passerelle or be conveniently stored creating a regular swim platform. 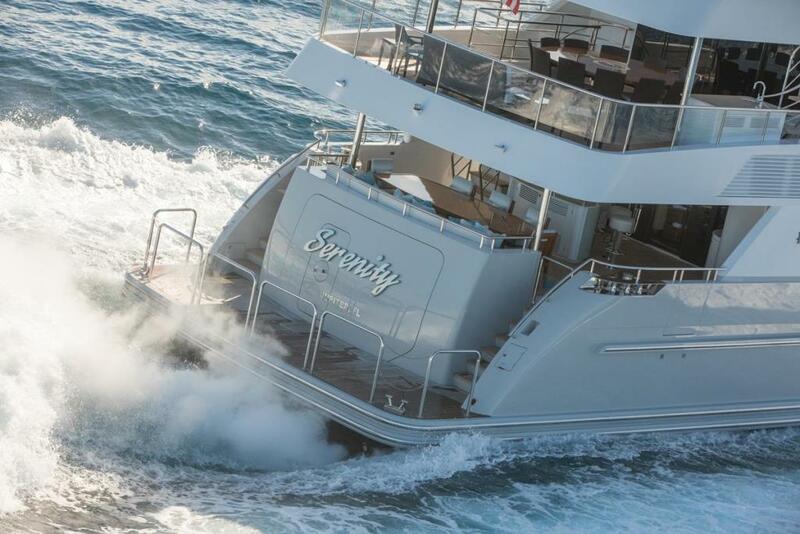 Serenity features 6 Owner/Guest Staterooms. 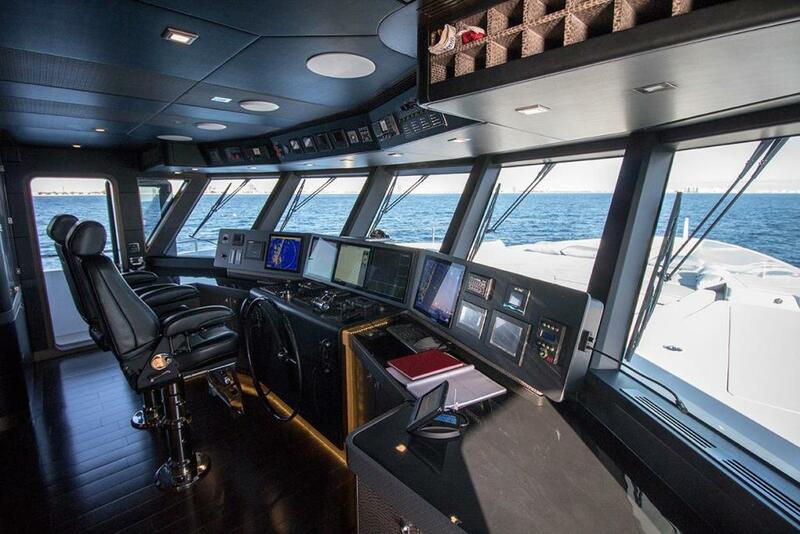 The full beam master is forward on the main deck. 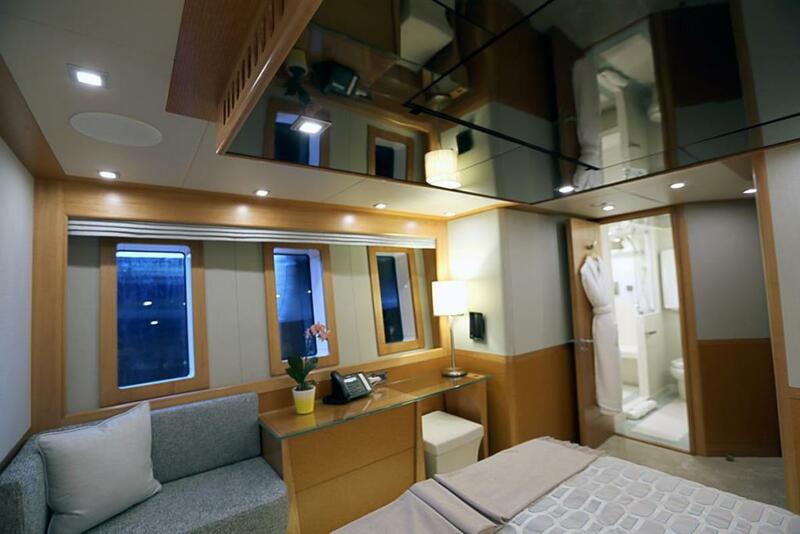 There are 4 spacious staterooms below deck. 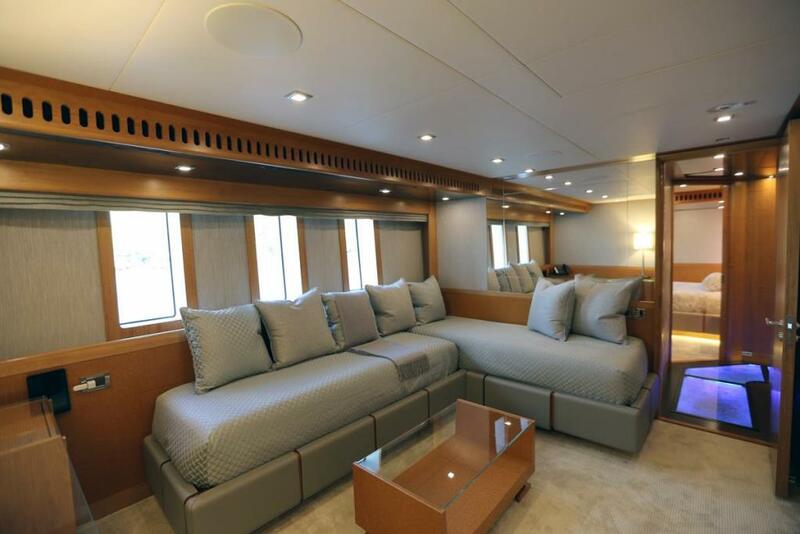 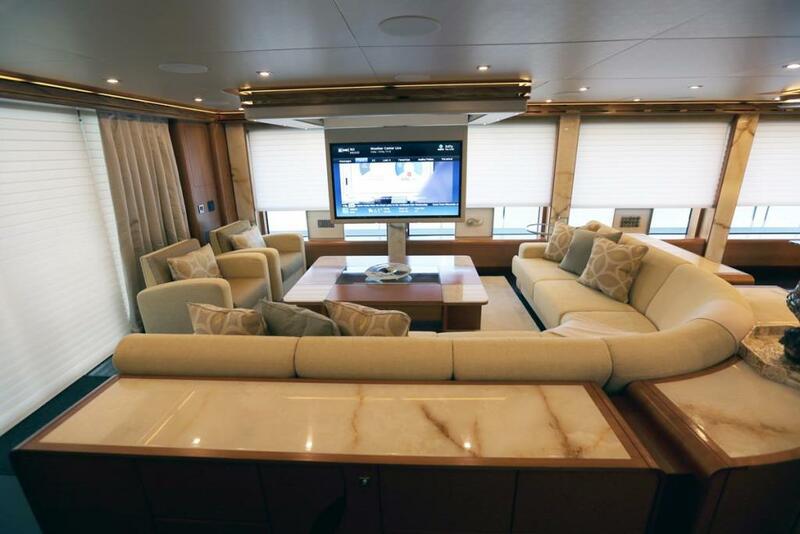 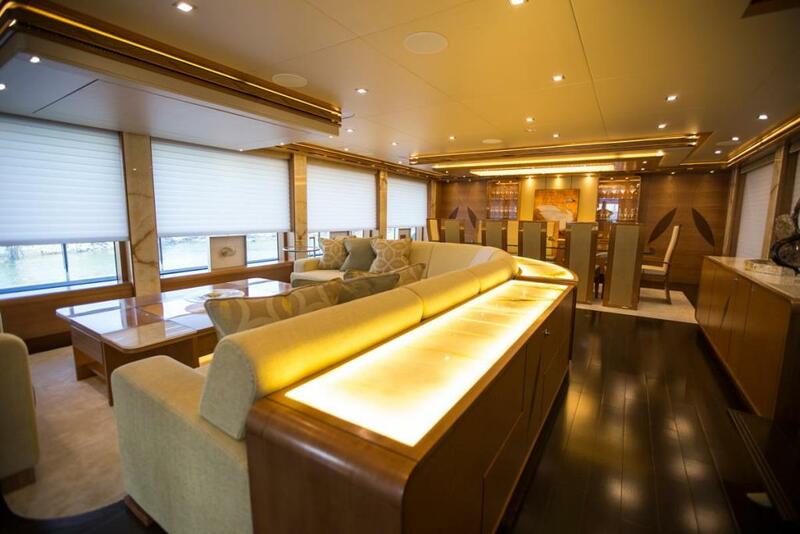 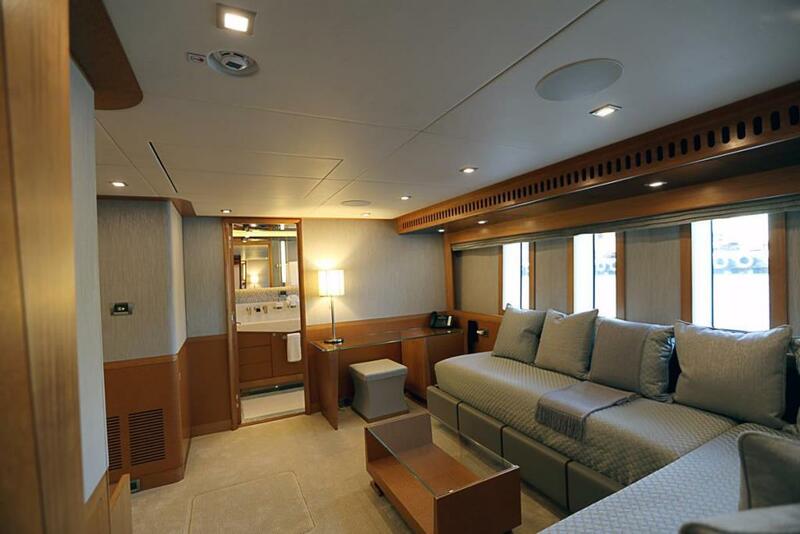 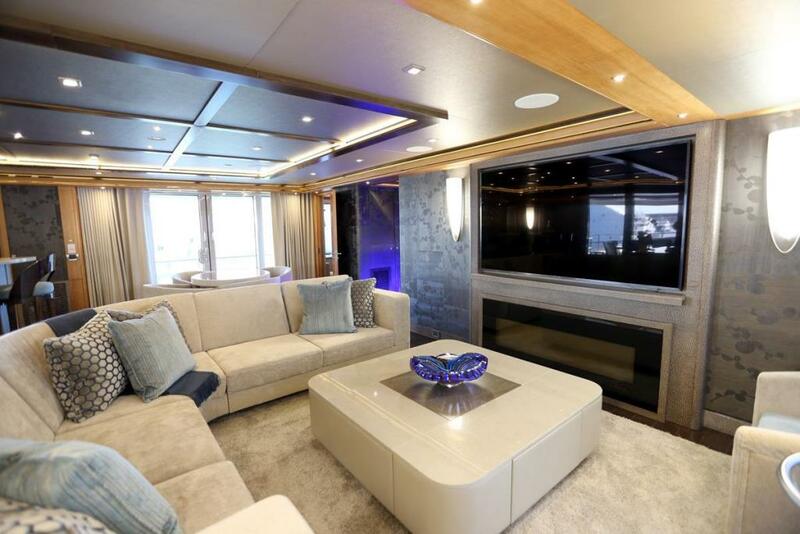 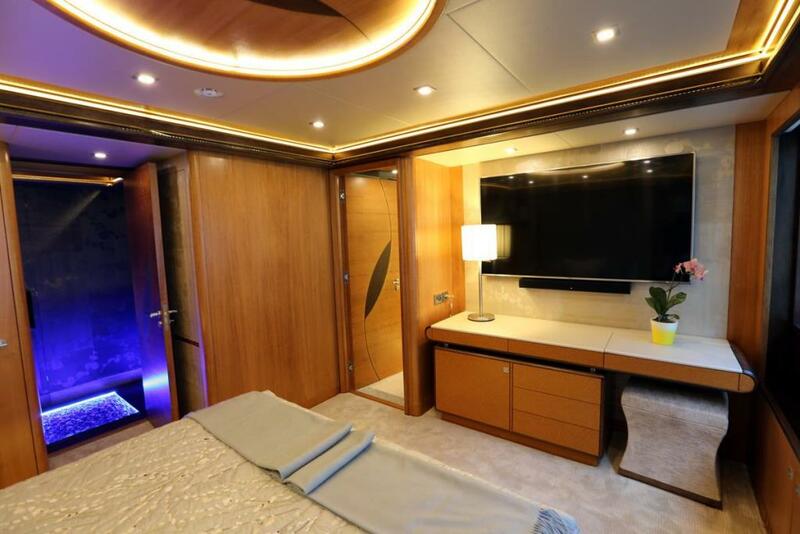 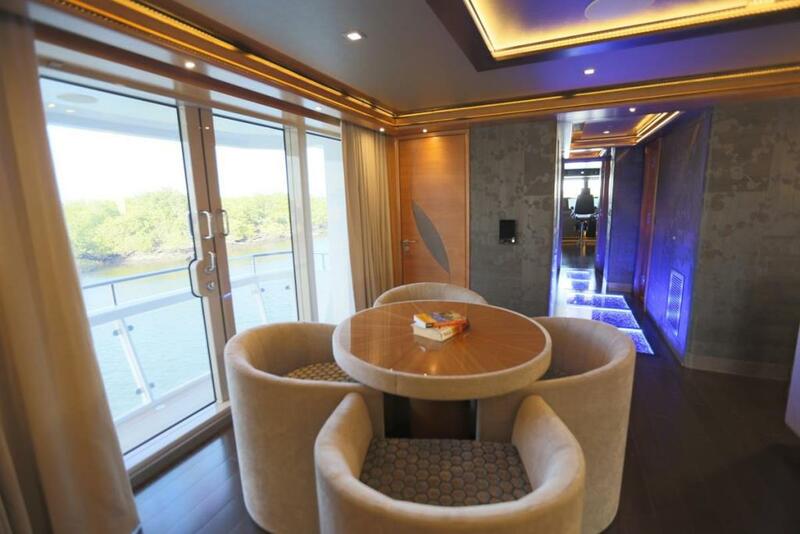 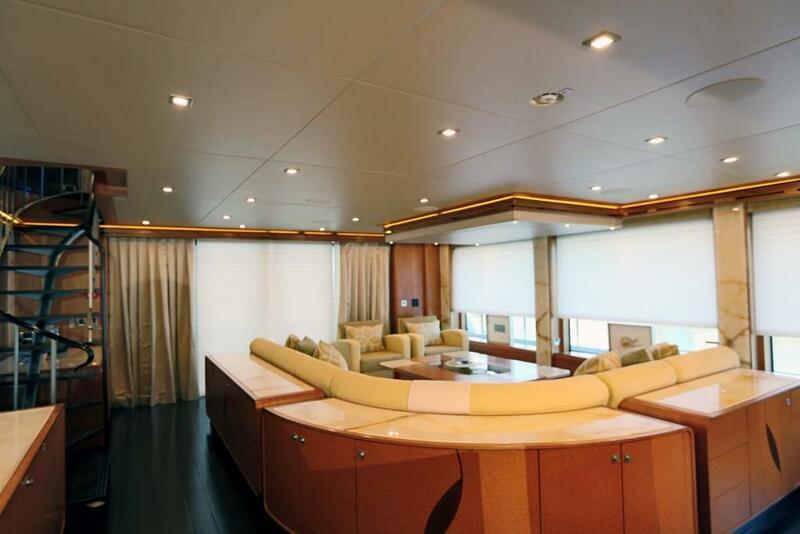 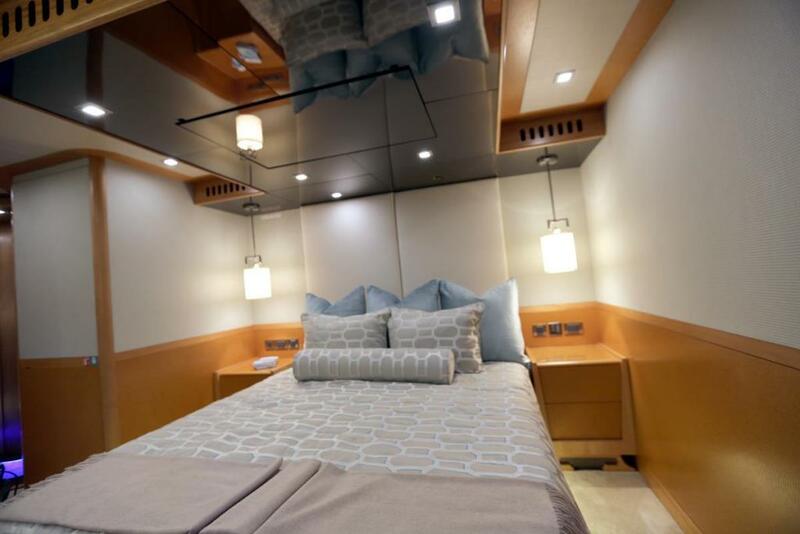 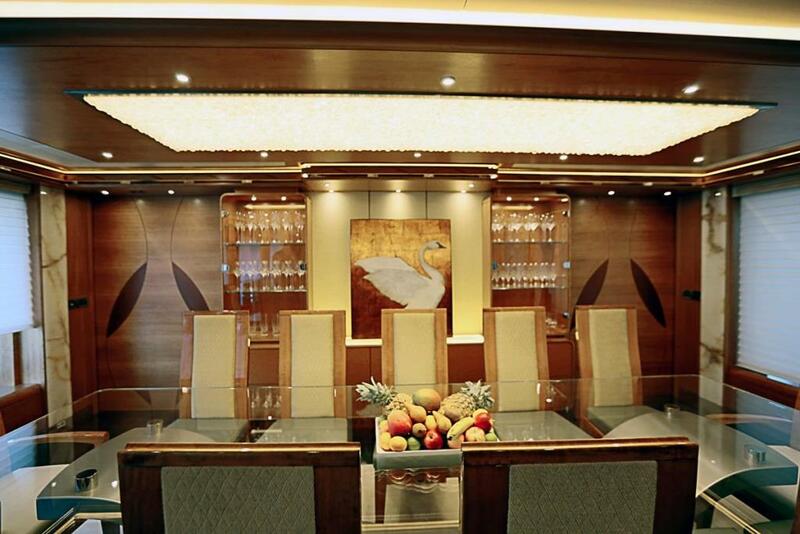 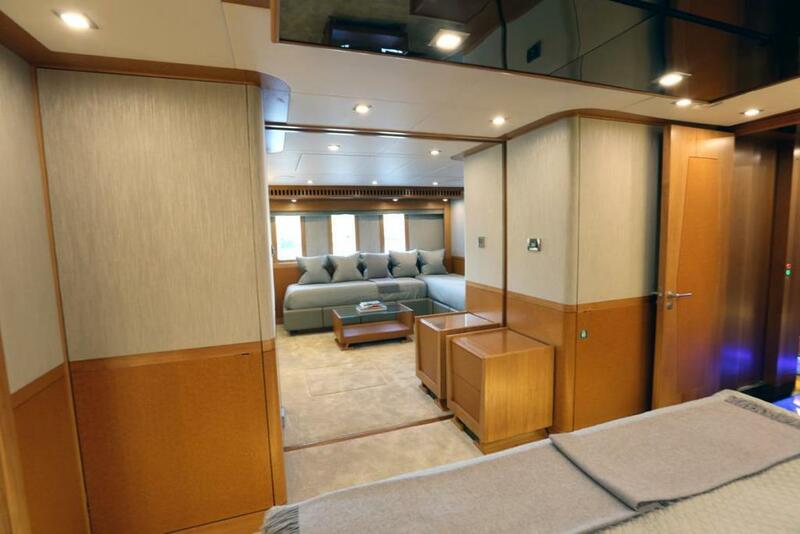 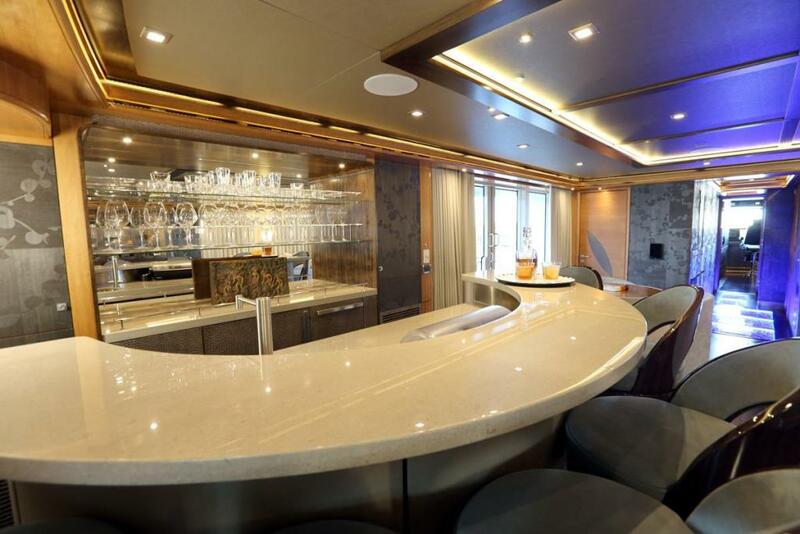 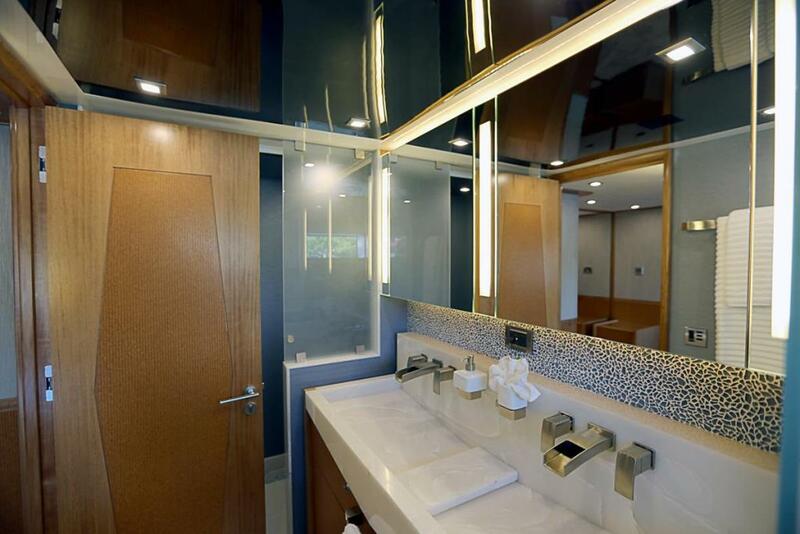 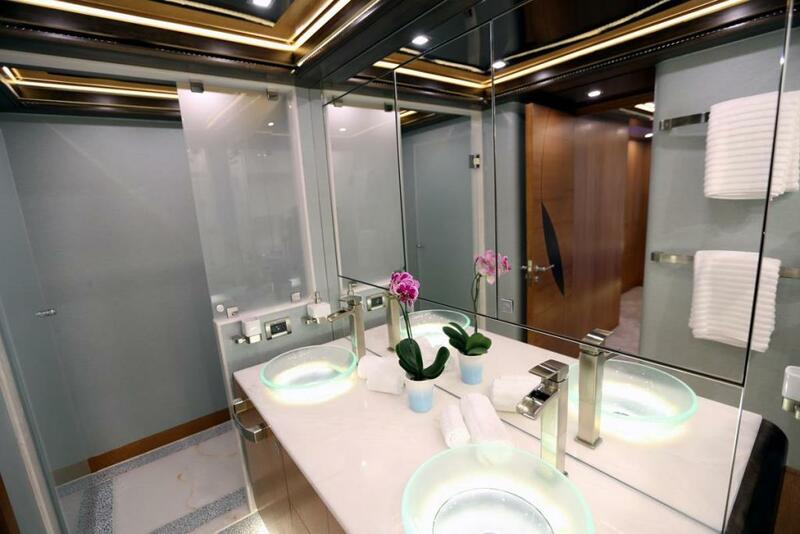 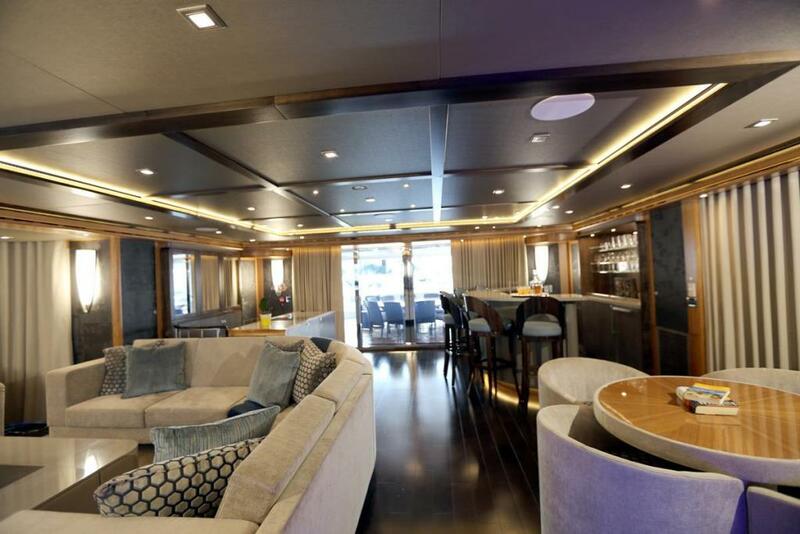 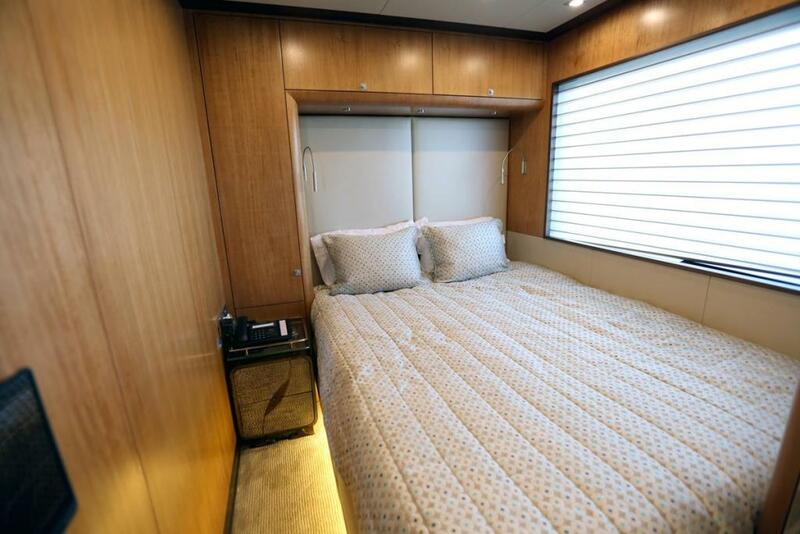 The 2 aft staterooms are divided by a partition, making this space either a full beam suite with his and her heads and sitting area or 2 king staterooms. 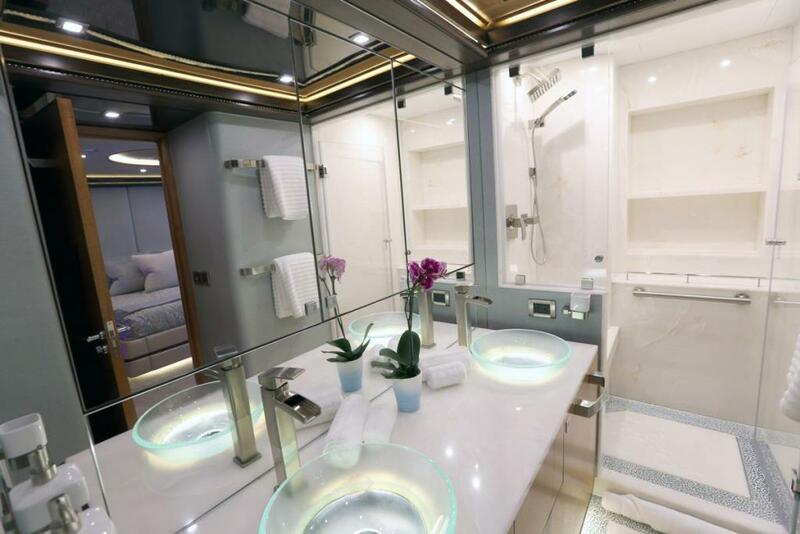 The two forward staterooms feature queen berths. 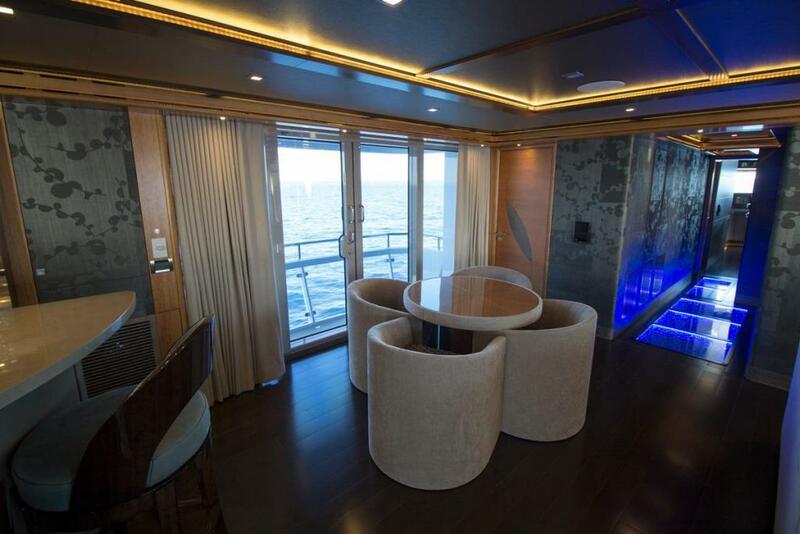 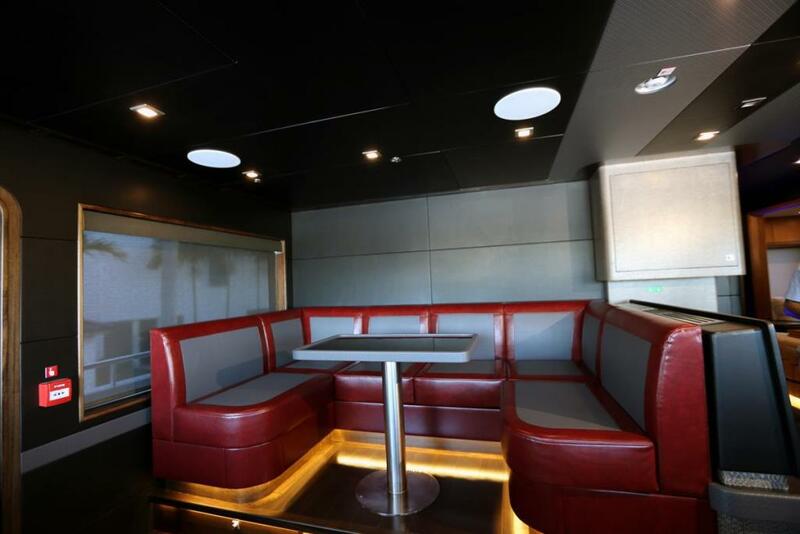 An additional VIP Stateroom is located on the Skylounge level forward of the living space. 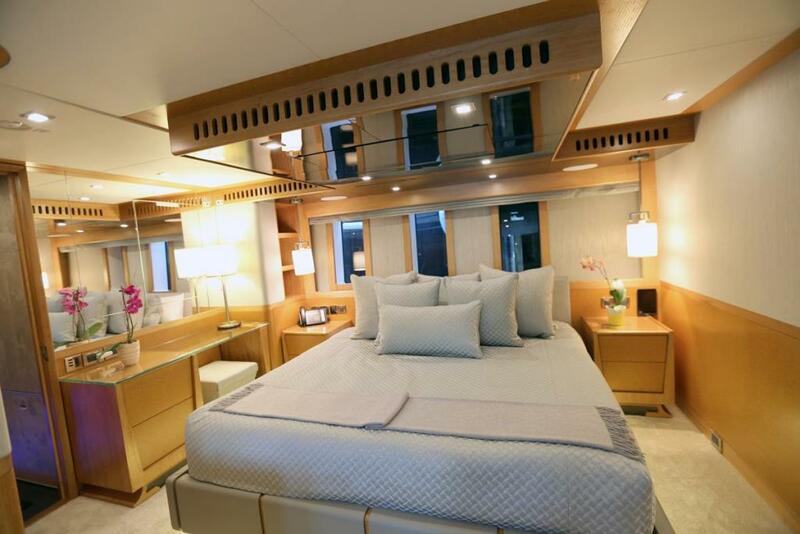 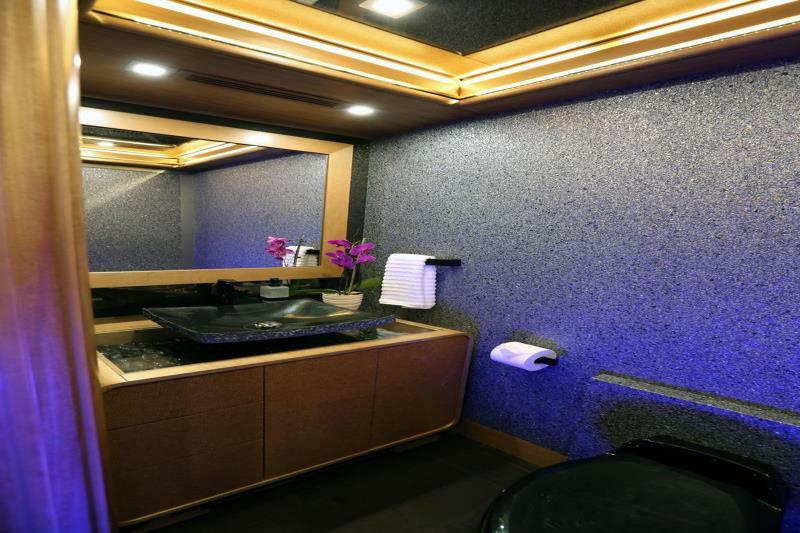 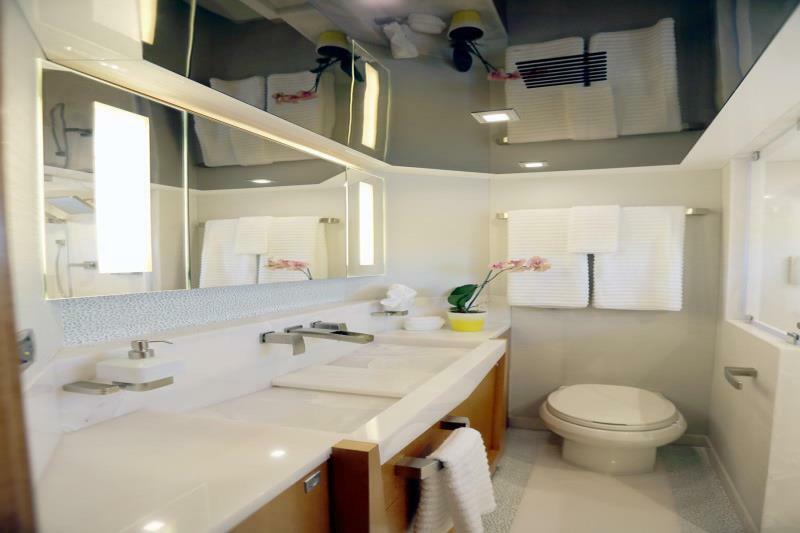 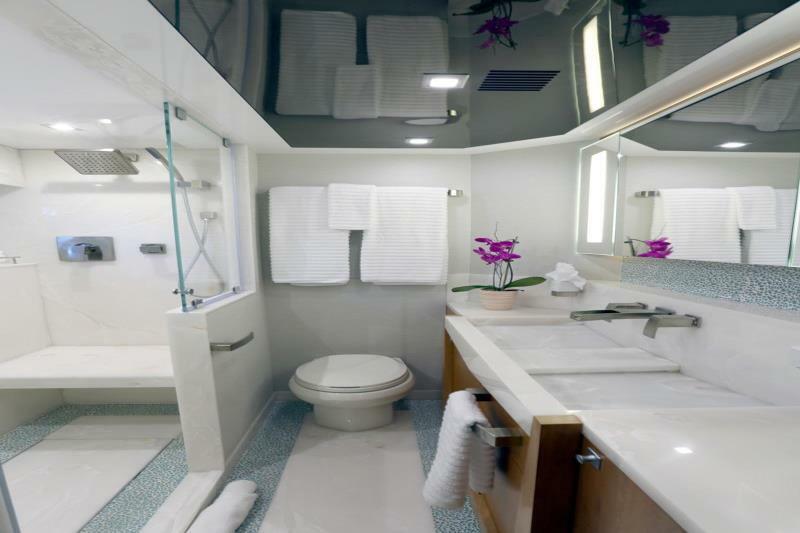 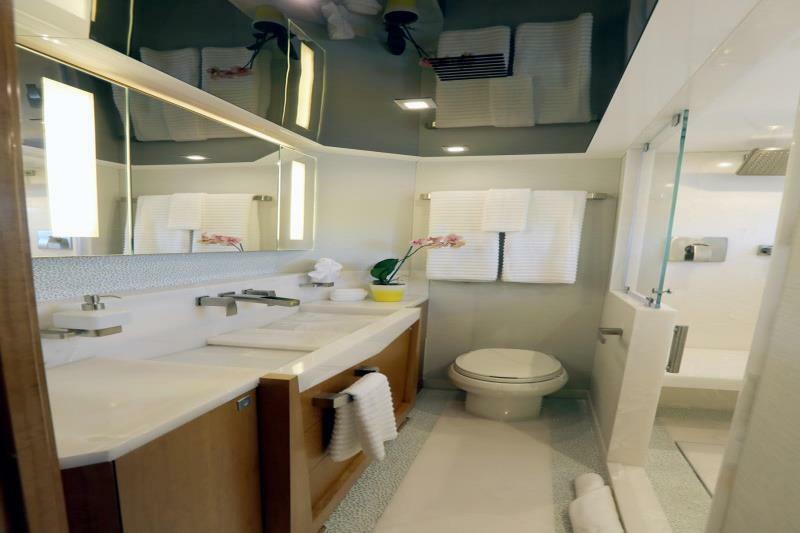 All staterooms feature en suite heads. 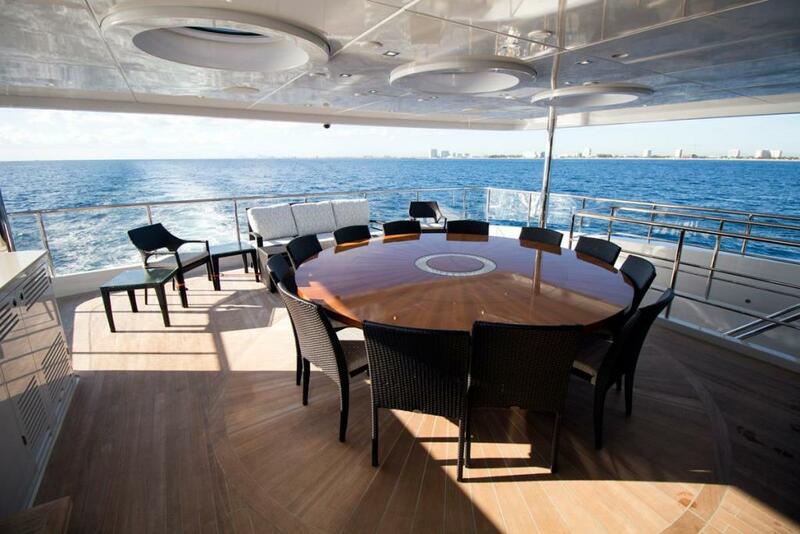 In total, there are accommodations for up to 12 Owners/Guests. 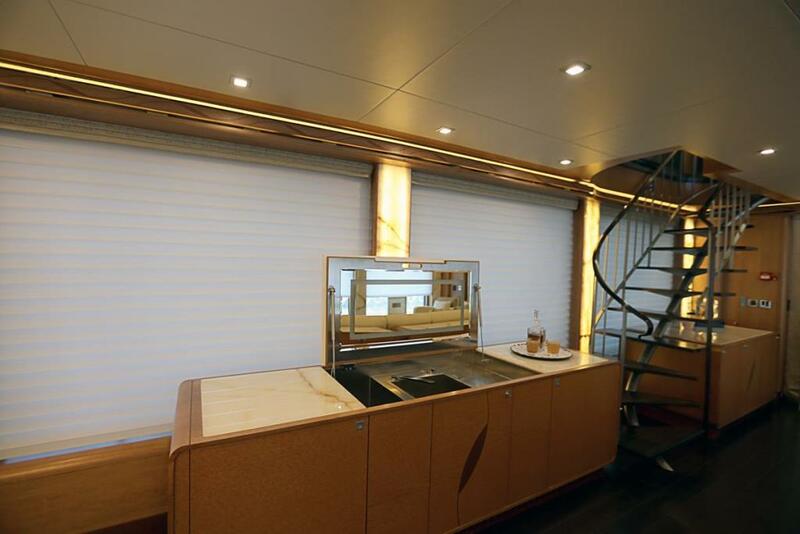 Crew Accommodations are forward below deck and may be accessed from the galley or the Foredeck. 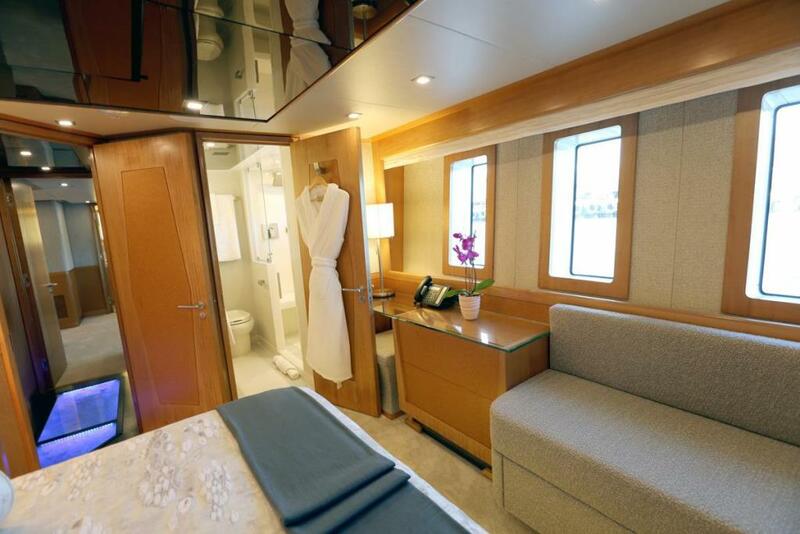 There is also a access door to the lower staterooms, making it convenient for cleaning. 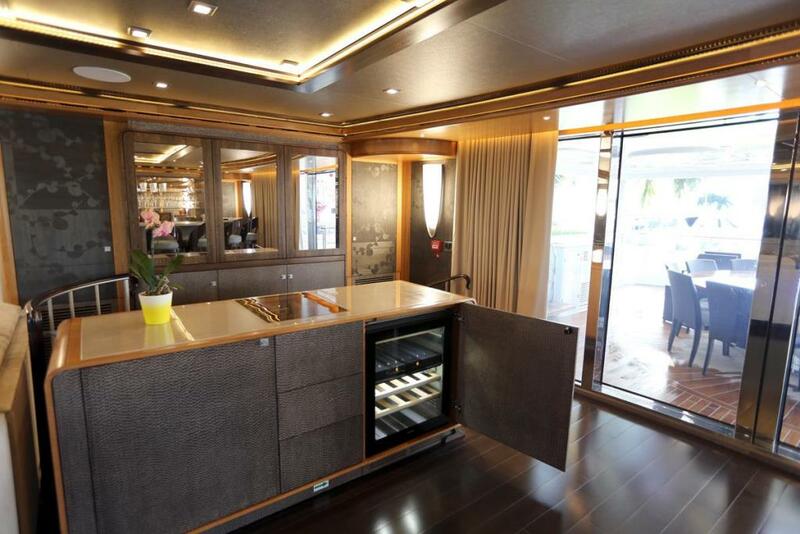 The area is complete with dining area and lounge. 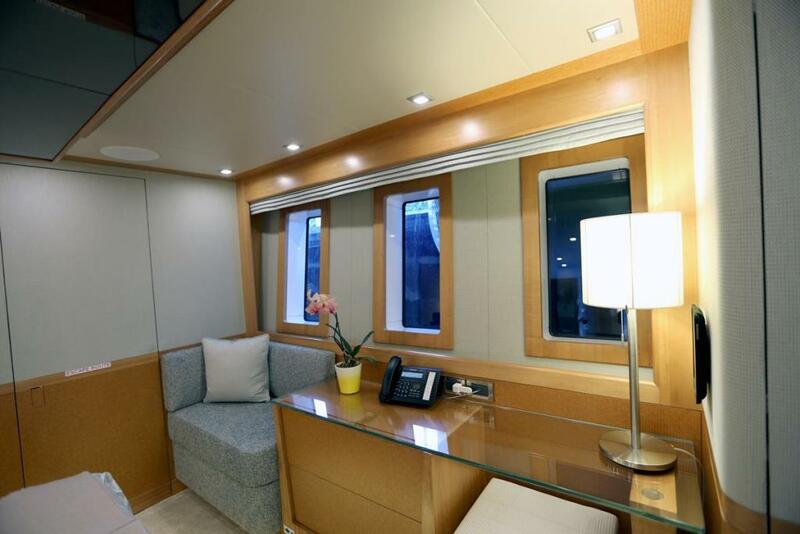 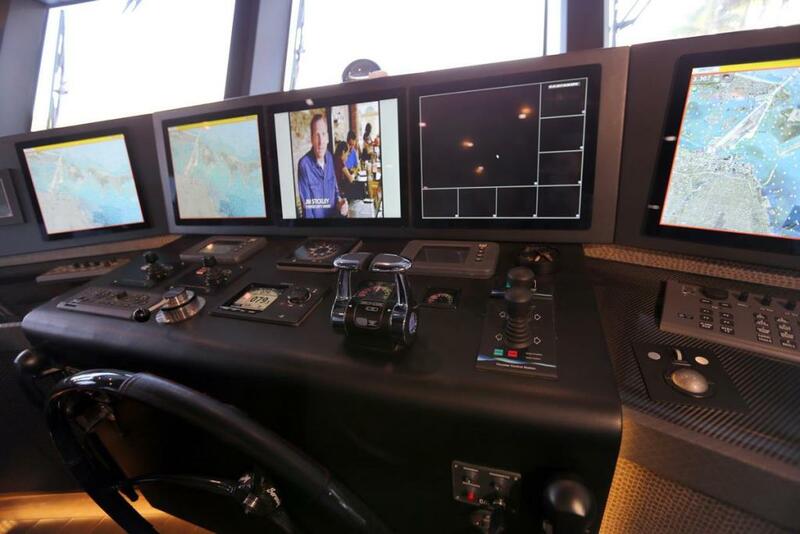 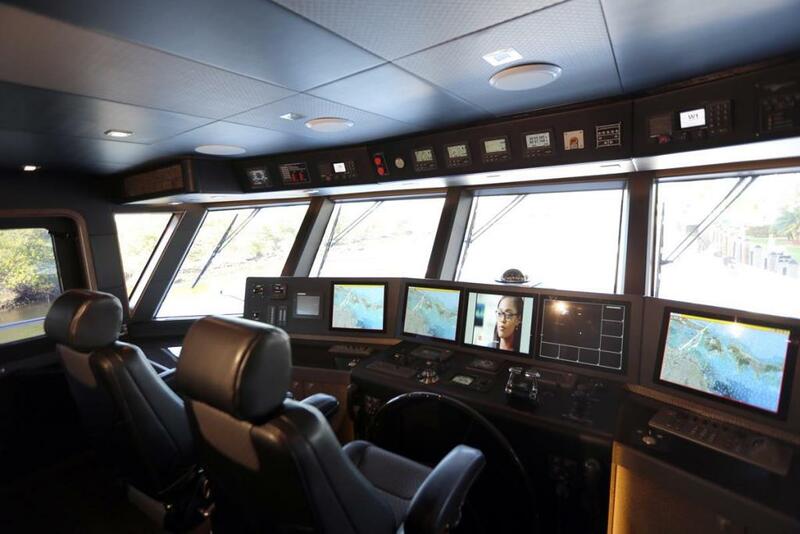 There are 3 crew staterooms/3 heads accommodating up to 6 crew below deck. 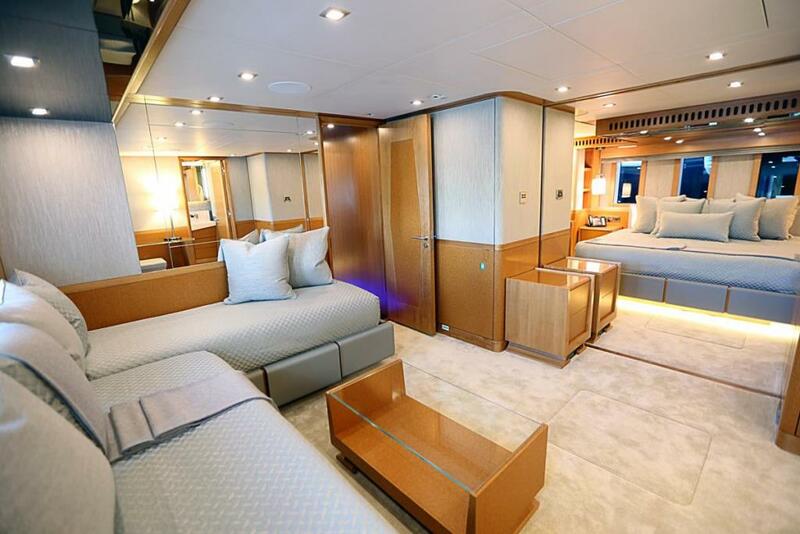 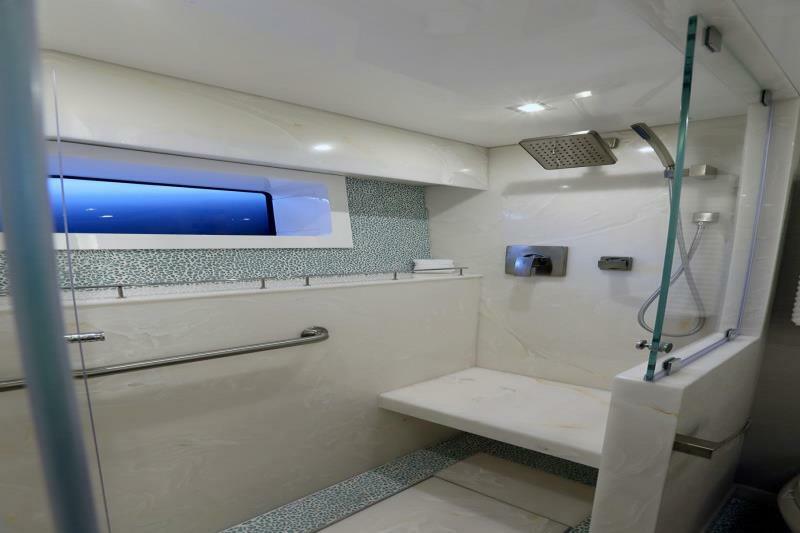 The captains cabin with en suite head is on the Skylounge level forward. 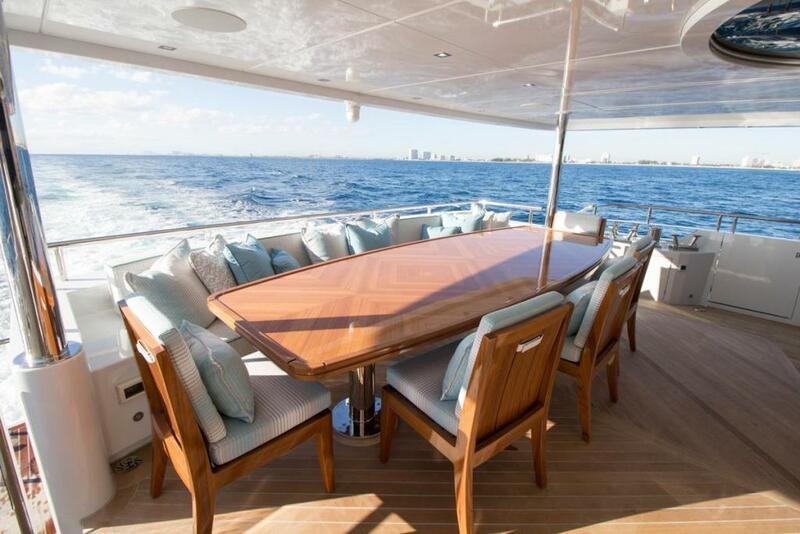 This listing is courtesy of the BoatWizard MLS and may be centrally listed with another broker. 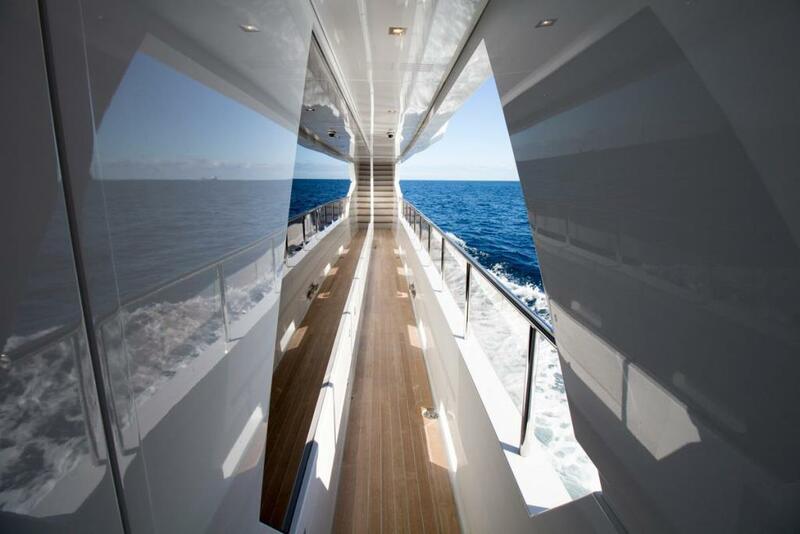 It is offered as a convenience by this broker/dealer to its clients and is not intended to convey representation of a particular vessel.